What jersey numbers will Odell Beckham Jr., Kareem Hunt, Olivier Vernon and Sheldon Richardson be wearing for the Cleveland Browns? CLEVELAND -- Between a slew of signing and a pair of trades with the New York Giants -- including one big blockbuster -- the Cleveland Browns have been one of the busiest teams of the still ongoing NFL offseason. And with the team's flurry of acquisitions comes a new set of jersey numbers, which the Browns this week as players report to Berea for offseason workouts. In the cases of Strong (Jaguars), Beckham (Giants), Hunt (Chiefs), Vernon (Giants) and Taylor (Buccaneers), those players will be wearing the same numbers they wore with their previous teams. Murray, Kush, Harris and Richardson, meanwhile, will each be wearing new digits, with their most-recent jersey numbers already spoken for on the Cleveland roster. 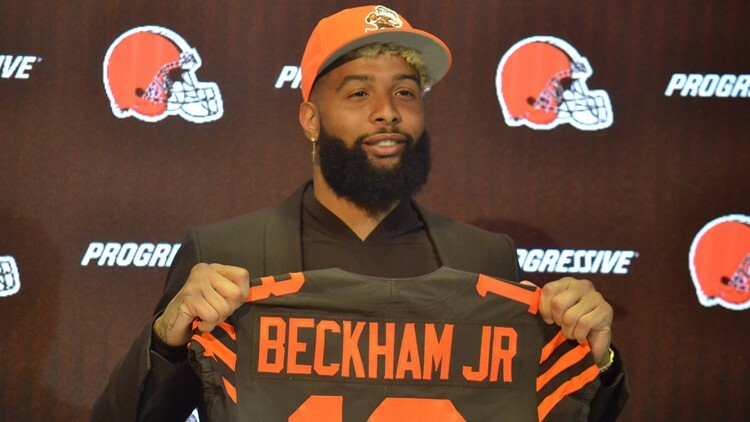 Perhaps the most notable new Browns number comes in the form of Beckham, whose jersey went on sale at the team's pro shop at FirstEnergy Stadium moments after his acquisition became official last month. While Beckham jerseys are the only ones of the Browns' latest acquisitions that have been pre-produced -- and available at local retailers -- it's worth noting that the Pro Shop at FirstEnergy Stadium makes customized jerseys on-demand, which retail for $110.